The externally-mounted underwater wide-angle adapter, nowadays often called a 'wet lens', has been around in commercial form at least since the 1970s. The first widely-available offering of good optical design was the Sea&Sea SWL16 (super-wide lens, 16 mm), which was brought-out in a version that could be screwed to the 58mm filter thread of the Nikonos W-Nikkor 35 mm f/2.5 lens. This, as has now become standard underwater optical practice, was an afocal converter with a flat front surface, based on (but by no means identical to) a type of underwater port known as a 'Rebikoff-Ivanoff corrector'. Rebikoff-Ivanoff corrector, in its basic form, consists of a plano-concave front element with a magnifying element behind. It eliminates the optical distortion caused by a flat air-water boundary. The lens elements can be mounted in their own underwater housing, allowing the rear surface to be placed close to the flat port of an underwater camera housing. If the intervening water layer is thin, the external lens corrects for the distortion caused by the port. The afocal wide converter became a popular accessory when Olympus, having decided to make underwater protectors (the PT series) for its digital compact cameras, started (at model PT-009) to put a filter thread on the outside of the lens port. At PT-010, the M67 filter thread was introduced, and subsequently became standard for the larger compact models. Later miniature compacts (the μ-series) were usually given an M46 thread, although other sizes were used. Thus there was a small revolution in underwater photography; the digital compact camera with converter lenses replacing the interchangeable-lens Nikonos, and perhaps surprisingly, doing a better job. Other big-name camera manufacturers soon also started to produce water protectors; and while these housings had no filter thread because the company decision makers were all psychologically incapable of providing support for 3rd-party accessories, the independent manufacturers soon started to make a variety of M67 and bayonet port adapters to allow their converter lenses to be used. The digital camera market reached a state of maturity in 2004 (there have been worthwhile developments since then - IS, better signal-to noise ratio, interchangeable lens compacts - but no radical changes of technology or working practice). Thus lots of people were using compact cameras underwater; and it became obvious that digital cameras of ≥ 5Mp (assuming a decent sensor size) could easily out-perform most 35 mm film cameras. So it was, at that time, that the author carried out some comparisons of the various available external wide coverters, and did a little reverse optical engineering to find out how well they were corrected for aberration and geometry. Since then, data for more recently designed lenses have also been added. The whole collection tells a story, not necessarily of constant progress, but of the challenges created by the subsequent move to ever-wider zoom lenses, and the optical degradations that can result. Firstly, although it is still important to take photographs from reasonably short range because water is usually cloudy, the need for extremely short camera-to-subject distances harks back to a time when photographs were taken on daylight-balanced transparency film and displayed by direct projection. Hence there was no opportunity for white-balance correction and, for example, even at a distance of only 1.25 m, the light path from flash-to-subject and back to the camera is 2.5 m, meaning that the exposure at the red end of the spectrum is, in that case, one f-stop less than at the blue end. Thus all photographs tended to have a bluish cast, and extreme wide-angle photography was the key to producing pictures with highly-saturated reds and yellows. Nowadays, of course, white-balance correction is simply a matter of adjusting the relative gains of the red, green, and blue image channels; a procedure that can be carried out in camera or in post-processing (with negligible loss of quality if a 16-bit per channel RAW format is used). Hence, it is no longer quite so important to get close, and backing away a little helps to reduce perspective distortion. If a supplementary lens vignettes, you can zoom in. If the image has barrel distortion (see below), you can also use a computer to restore rectilinearity by applying radial correction, and this will increase the image area that can be retained after rectangular cropping. It must be recognised, of course, that people find optical correction software complicated, and vignetting is annoying. It can easily be the case however, that a wide adapter that vignettes to some extent can give better optical resolution than one that does not. If that is so, then zooming-in (or even cropping the image later) to remove the vignette with the good adapter will give better pictures than can be obtained with the inferior one. 1) It should correct for the defects introduced by the flat port on the camera housing (without causing other forms of optical degradation). 2) It should increase the FOV, at least restoring it to be the same as given by the camera lens in air. 3) It should not vignette at the full-wide camera zoom setting (but we might forgive it if it is good at 1 and 2). In order to understand what constitutes a good wide converter, it will be helpful to consider the effect of a flat water-air boundary, and also the various ideosyncracies of wide-angle lenses. A lens that preserves straight-lines and right angles in an image is said to be 'rectilinear'. Assuming that the camera has a perfect rectilinear lens (rarely the case in practice, especially at the wide setting of a zoom lens), the effect of a flat port underwater is to produce pincushion distortion and colour-fringing in off-centre detail, as shown in the simulation below. 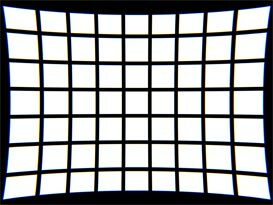 Pincushion distortion occurs because the image magnification increases approximately in proportion to the cube of the distance from the lens axis (which corresponds to the mid point of the picture). Points at the corners of a rectangular object then appear pushed-out because they are further from the centre than are points at the edges. 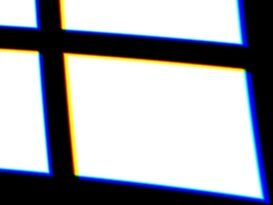 Colour fringing (chromatic aberration) occurs because the magnification at the blue end of the visible spectrum is greater than the magnification at the red end. Taking the middle colour (green) as reference, the deviation for blue is about twice that for red, because red is closer in wavelength to green than blue is. Thus we see a blue fringe on the outside of a white object, with a fringe of the complementary colour (yellow) on the inside. Buried underneath that is a red fringe on the inside, with a complementary cyan fringe on the outside. The simulation is for a 24 mm lens (assuming the 35 mm format) behind a flat port. The effect is less severe for lenses of longer focal length, but bear in mind that the images above are small. Even at moderate magnification, the degradation is very noticeable for 28 mm lenses. The most obvious method of correction for the defects introduced by a water-air boundary is to place an air-water boundary parallel to it and a short distance away. If the two boundaries are close, the distortions introduced are almost exactly equal and opposite, and it should be obvious that the correction becomes perfect at the point where the two surfaces come into contact and all of the water is driven out. To provide the correcting air-water boundary, of course, we need some kind of air-filled submersible lens, and the dome converter (see flat-port vs. dome port) is one suitable candidate. The effects of an air-water boundary followed by a water-air boundary cancel out, provided that the surfaces are parallel and the intervening water layer is thin. The other primary contender is the Rebikoff-Ivanoff corrector that, although not actually providing a flat air-water boundary at the back element, nevertheless corrects internally for the geometric distortion due to the flat port and can be designed with a flat back surface if so desired. It also has greater potential for modification than a simple dome converter, but it requires a little more design work to make it good. Modern wide-angle converters are not simple two-element Rebikoff lenses for two reasons. Firstly the original design has no correction for dispersion in the lens material, and so it is desirable to include one or more additional elements to make it achromatic. Secondly, there is some advantage to be had by adding more elements in order to increase the field-of-view. Thus a typical formala might involve, say, 5 elements in 4 groups, and even though it still looks like a Rebikoff lens from the outside, it is much more complicated internally. 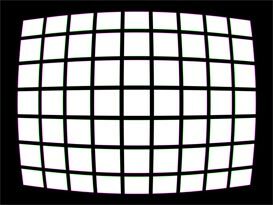 Measures designed to increase the FOV tend to affect image geometry in ways normally associated with wide-angle lenses. The usual effect, shown below, is known as 'barrel distortion' if you think that it is a bad thing, and is called the 'fisheye effect' if you are trying to argue that it is a good thing. 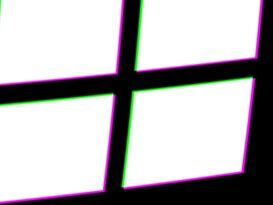 There is also a tendency to introduce more chromatic aberration, this time of a different appearance to that produced by lens ports, as illustrated (hypothetically) in the corner detail image, and this requires further correction. Fishye distortion is sometimes considered to be a good thing because, in very wide angle photographs, assuming a flat object field, points near the centre are much closer to the camera than points at the edge. This causes perspective distortion, which is offset to some extent by the fact that the magnification of a fisheye lens diminishes on moving away from the axis (causing the corners to appear to be pulled inwards). Whether the fisheye effect is actually a good thing is moot. It is certainly deleterious to technical photography and to the realistic depiction of man-made objects; but if there is one universal, it is that rectilinear wide-angle lenses cost a lot more than ones that suffer from barrel distortion. Also it should be noted, that camera zoom lenses can only be made perfectly rectilinear at one focal length setting, and they almost invariably develop barrel distortion at the wide end. This is one reason why knowledgeable photographers tend to avoid using super-zoom lenses. So, we are probably not allowed to complain about barrel distortion in wide-converter lenses, expecially if the manufacturer has called it a 'fish-eye' lens. Fortunately, for technical photographers, the distortion can be removed in post-processing by applying radial correction, and as mentioned earlier, if there is any cutting-off at the corners, the geometric transformation will tend to push the vignette out of the final picture. Inon introduced a convenient nomenclature for wide-angle conversion lenses and we use it and extend it here. Firstly, a supplementary lens is designed with a particular minimum focal length of camera lens in mind. This is very important, because the FOV of the camera dictates how large the optical aperture of the converter needs to be (roughly as indicated by the diameter of the back element) if the system is not to vignette. In practice, this designation is unreliable because it also depends on the distance from the entrance pupil of the camera lens to the converter's exit aperture, and this is by no means controlled from one camera system to the next; but at least it gives a rough idea of what is likely to work. Secondly, the lens has a mounting method. Thus we might have, say, a 32M67 lens, which is designed to work with camera lenses of f ≥ 32 mm (35 mm format equivalent) and screws into an M67 filter thread. Also, we might have, say, a 28LD lens, which works with lenses of f ≥ 28 mm, and attaches to ports and port adapters having an Inon LD type bayonet ring; etc. Note that the design focal length is only a rough guide. Also, there might be good reason to use a converter with an under-sized exit aperture and zoom-in a bit. In 2004, which is roughly year zero for high-quality digital underwater photography, compact cameras had modest (often internal focusing) zoom lenses with a minimum 35 mm equivalent focal length of 35 mm. Admittedly, Olympus had brought out the C-5060, which went to 27 mm, and the C-8080, which went to 28 mm, but neither of the companion housings was intended to be used with an external wide converter. Thus wide converters were designed for f = 35 mm lenses (or perhaps a little shorter to be on the safe side). The move towards 28 mm maximum-wide was unavoidable however, and this presents supplementary lens designers with the problem of where to put the magnification (actually, de-magnification in the case of a wide converter, but that just means that the magnification is <1). At f = 28 mm, the camera is already fairly wide and so, for a given overall FOV, do we let the camera do the work, or do we let the converter do the work? This is quite a dilemma, because letting the camera do the work implies a converter with a large aperture, which will be difficult to correct; whereas letting the converter do the work, means telling the customer to zoom in to get rid of the vignette. It is in such situations that the denizens of the marketiing department are wont to step-in and speak the otherwise unutterable: most people don't think about optical resolution, but everyone can see it when the corners are chopped off. Some compact cameras now zoom-out to 24 mm . . . . . . . Wide converter test pictures gathered over a number of years (using a variety of cameras) are given in the articles that follow. When viewing those articles, note that the idea is not to measure the magnification provided by the converter (which is in any case available from the product literature) but to obtain a quantitave measure of geometric distortion and chromatic aberration, i.e., we want to know how well the lens corrects for the water-air boundary and its own internal defects. The method used is to take test-card pictures and apply radial corrections using the Panorama Tools 3rd party Photoshop filter plugin, the requisite information being obtained by comparing the correction coefficients. The degree of improvement obtained after correction might also encourge some readers to give radial correction a try. Note also that there are easier ways to correct images than using the Pano Tools software interface. Some programs, such as Adobe Photoshop Lightroom offer simple slider controls that, although having a somewhat restricted adjustment range, are adequate for most purposes (see Image radial correction). © David W Knight. 2012, 2018.